Harrison Square is an identity for a conceptual urban infill project in Omaha, NE. The project considers new opportunities for an area of downtown Omaha that has been largely ignored in recent years and is comprised mostly of empty parking lots. St Mary’s Avenue first existed not as an avenue, but as a shortcut, a driveway of sorts, for early homesteader Harrison Johnson. The road provided him easy travel from his country home to the city. Johnson was one of the first prominent settlers of the Omaha region, and served as a member of the territorial legislature. Not only that, but he literally wrote the book on the History of Nebraska. The diagonal road was later dubbed St Mary’s Avenue, after the nearby convent of the same name. Much like Johnson intended, it was used as a thoroughfare connecting downtown with western neighborhoods. Direct competitors include the Old Market, Benson, and Blackstone District because these are all historic areas that have been revitalized in recent times. These districts have largely preserved the architecture of the neighborhood. Secondary competitors include Aksarben Village, Midtown Crossing, and many more. These are mixed-use developments that have demolished older buildings to make way for more modern structures. The buildings often have steel and glass exteriors, lending to a more corporate environment. Due to its proximity and name recognition, the Old Market is our primary competitor. It has a focus on boutique shopping that is more likely to attract people with higher incomes. Most of the shops sell art, clothing, or unique gifts. That being said, it has a strong bar scene that helps attract a younger demographic. The Benson neighborhood is dominated by bars, with over 15 of them in a 4-block area. Not included in the percentages are the cigar shops, tattoo parlors, and other businesses that contribute to Benson’s reputation as Omaha’s quirky, “hipster” neighborhood. Benson is known for their First Fridays, and home to multiple live music venues which help attract people interested in arts and culture. The Blackstone District, the most recent of these neighborhoods, is clearly following the trend. They have a high percentage of bars and restaurants with a few boutiques sprinkled in. However, developers have torn down buildings in order to build high-rent housing that is pushing out many former residents of the neighborhood. "Harrison Square preserves and advances the culture of Omaha, while being accessible to people of all socio-economic backgrounds. It is an authentic downtown experience in the era of strip malls and steel walls." 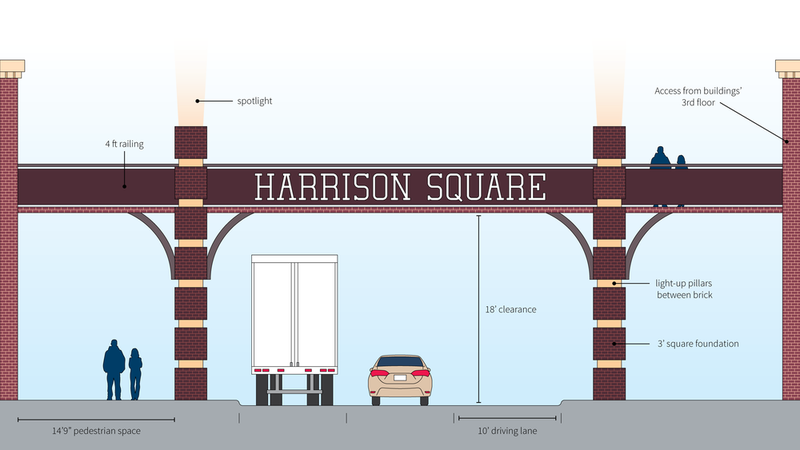 Culture – Harrison Square honors the city’s past and acts as a cultural hub for the future. Community – The neighborhood creates a sense of belonging, and a sense pride in your city and your neighbors. Accessible – We make it easy for people of all walks of life to live and visit. Authentic – Harrison Square was founded with the purpose of preserving the heart of Omaha, not contributing to the westward expansion of the city. Intrigue – Harrison Square is unlike any neighborhood in Omaha, making it a must-visit destination for residents and visitors alike. 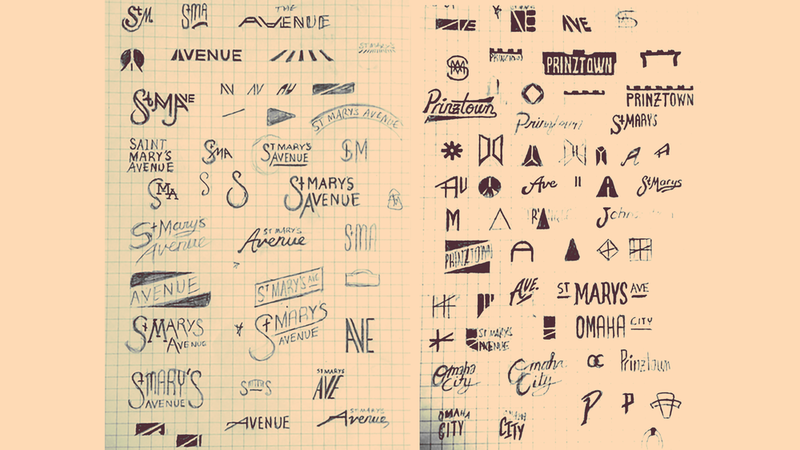 My branding process involved brainstorming potential names by examining the terms and phrases commonly used to describe neighborhoods in cities around the world. I also complete hundreds of sketches before arriving at the name Harrison Square, after the aforementioned Harrison Johnson. The logo was designed to be extremely versatile in application. The simple two-square design represents an abstract window shape, making people feel at home. The two squares are also symbolic of equality and accessibility. In addition, a capital ‘H’ is formed in the negative space. This same spacing was used to create a custom accompanying typeface that has a familiar and established look without being overtly vintage. The Brownstone and Keystone colors were both chosen to represent historic brick buildings and convey Harrison Square’s mission of preserving architecture. The complementary colors are warm and inviting to create a sense of belonging. The 'Harrison' typeface was custom built based on the 4:1 square construction found in the logo mark. Another slab serif, Factoria is used for smaller headlines, and Industry is used for body copy because of its square construction and high readability. The icon style maintains the square shape from previous elements. The red accent color helps them to stand out when placed near other brand elements. 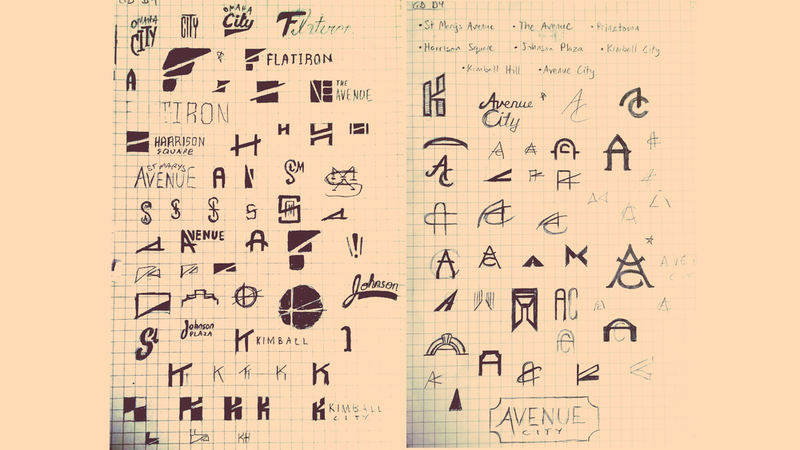 These would be used on maps, directories, and on the web, on an app, you name it. The stationery reflects the Harrison Square brand with visual consistency that is found in other materials. The postcard direct mailer positions Harrison Square as an intriguing destination to the receiver, with blank lines on the back to allow for a personalized touch. This is an example of a directory you might find in Harrison Square. The touchscreen interface allows for easy navigation, while the stone outer shell maintains an authentic city feel. Physical maps are available for free in the drawers below. The welcome sign and pedestrian walkway will serve as a hallmark of the neighborhood, inviting in resident and visitors alike. This sort of grand entrance is common in cities around the world, but is not found anywhere else in Omaha. It will also be a great photo opportunity for pedestrians on the ground, or those on the walkway above. At night, pillars of light shoot into the sky from either side, being visible from nearby neighborhoods as well.